Bizarrely written and largely unnecessary additions to the Rules of the indoor game. No alignment. 9.13 Umpires should place particular emphasis on limiting time spent in situations where the ball becomes trapped in the corners of the pitch or close to the side-boards (especially towards the end of matches) when the player in possession effectively shields the ball such that an opponent is prevented from being able to play it. Early interventions by the Umpires will make teams aware that this type of play or tactic is of no benefit to them. 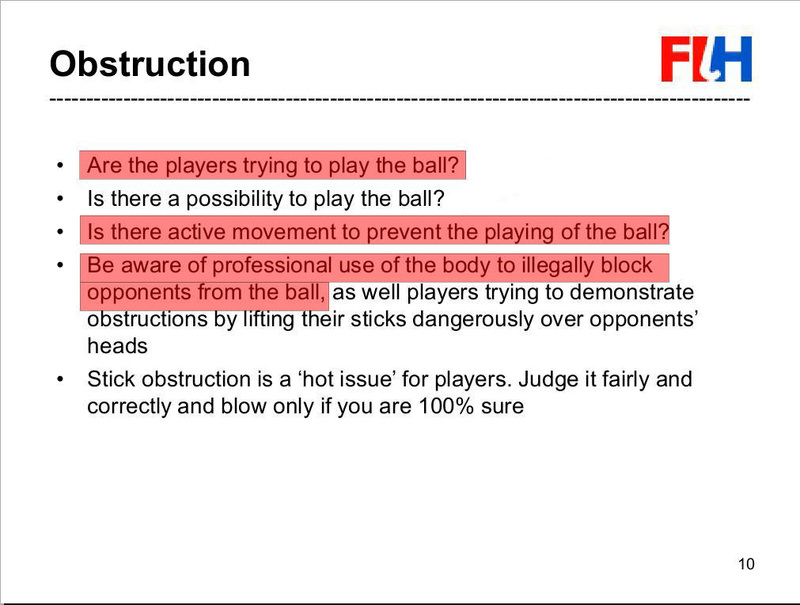 I will start by explaining what I mean by bizarrely written using the first part of the first sentence of the above Rule Explanation (which has not been added to the outdoor version of the Obstruction Rule, even though holding the ball in a corner of the pitch while shielding it to prevent a tackle, is common in the outdoor game) as an example. Umpires should place particular emphasis on limiting time spent in situations where the ball becomes trapped in the corners of the pitch or close to the side-boards (especially towards the end of matches) when the player in possession effectively shields the ball such that an opponent is prevented from being able to play it. When a player in possession of the ball shields the ball in a way that effectively prevents an opponent playing at it that is immediately an obstruction offence, so why is the above explanation focused on limiting the time spent obstructing opponents and then only in corners and close to sideboards and especially towards the end of matches. This is saying in effect that obstructive actions should only be penalised when they are not brief (brief obstruction offences are therefore acceptable ???) So I suppose not carried out with the intention of ‘running-time’ to the advantage of the team of the player committing the offence. What is the time limit for this foul which, I repeat, should be penalised immediately it occurs if it disadvantages an opponent? I have no idea, that is presumably an umpire judgement. The second sentence then presents an obstruction offence as a type of play or a tactic rather than as a foul. 9.19 Players must not trap or hold the ball against the side-boards. That is a simple and very clear prohibition. However it should but doesn’t only prohibit this action if it prevents an opponent playing at the ball. That is obvious to those who are familiar with the game, but not stipulating exactly what is meant is laziness. A player in possession of the ball may not be ‘trapped’ either in the corner of the pitch or against the side-boards by opponents with their sticks flat on the floor. Opponents must leave an outlet of reasonable size through which the ball may be played. That clause, besides giving the umpire a difficult judgement task, is ambiguous because it does not state that the player in possession of the ball must have the ball in an open position i.e a position in which an opponent could make a legal tackle attempt. So, following on from what is given in Rule 9.13 above, the player in possession could (briefly?) shield the ball anytime a tackle attempt was made and would, following Rule 9.19, quite quickly be awarded a free ball because opponents had him trapped against the side-boards or in a corner. This Rule appears to be written in opposition to the Obstruction Rule and to the advantage of a player who is in possession of the ball even if he or she is shielding the ball to prevent a tackle attempt. Examples of obstructive play close to the sideboards. 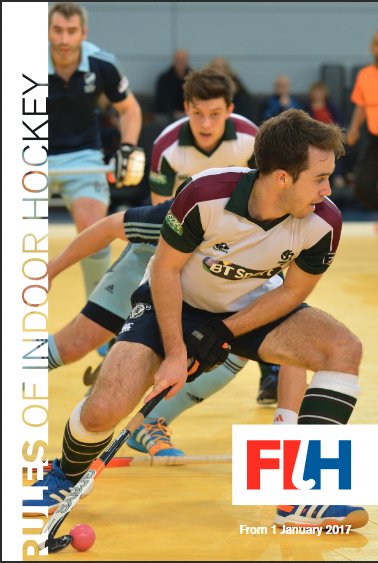 The second one is from the cover of the Indoor Rules rule-book. It is not necessary to make any comment about the following add-on clauses but the second of them is an attempt to tidy a ‘loose end’ in a previous clause, that exists as a result of poor initial drafting. Umpires should recognise and interrupt play, with a bully re-start, when the ball is either trapped between players’ sticks or becomes unintentionally trapped against the side-boards. Repeated instances of players trapping or holding the ball against the side-boards should be viewed as an intentional offence and penalised accordingly. Similarly, players who deliberately aim to trap the ball between their and an opponent’s stick should be penalised and not rewarded with a bully. and a rant about obstruction. The text below is taken from a part copy of the article by Todd Williams (link above) which was re-published on fieldhockey.com on 27th July 2018. All four teams can still progress and three of the four (Australia, NZ and Japan) are fighting to top the pool and go straight through to the quarter-finals. The margins are tight, every point and, in all possibility, every goal will be important in determining who progresses and who has to play in the, wait for it, pre-quarter-final cross-over elimination games, for finishing second or third. The stakes at a World Cup are, as you would expect, as high as they get. The preparation has been extensive and intensive but that of course doesn’t guarantee anything. Part of the appeal of sport is the fact that luck will play its part; whether that be the bounce of the ball or the shot off the post or goalkeeper that goes in or stays out. Umpiring decisions also come into that category and there will always be, and should be, moments in sport where the interpretation of the umpire determines in what direction the play should go. That said, the successful and effective introduction of the Video Umpire into top-level hockey has given teams at least one opportunity to question whether or not they’ve been on the wrong end of the stick from a big decision. Seeing goal, penalty stroke and penalty corner decisions questioned and then overturned is now common place and all teams are aware of the need to use their referral, particularly early in the game, with care. Critically, with the sheer speed of the game, as well as the congestion and intensity of the attacking circle, it makes absolute sense that on-field umpires have this extra resource to help them get as many of the big decisions correct. That is why, sensibly, umpires also have the ability to make their own referrals when they sense that something they were initially sure about needs a second look. With all these points in mind, doesn’t it seem a little bit crazy that the final make-up of Pool D, including which team’s tournament finishes then and there, could come down to a goal that was clearly scored off the back of the stick? By pure coincidence, this conversation actually started on day one, with Japan’s second goal against Australia. With the umpire quite rightly allowing an excellent advantage instead of awarding a penalty stroke, Akiko Kato swept the ball on her reverse into the goal. The only trouble was the replay showed that it almost certainly had been hit flush, not even off the edge, but with the whole back of the stick. Given that the game was into the last minute and Australia still had a referral, it seemed strange that they didn’t go the Video Umpire. Barring the extraordinary, they had nothing to lose and, if successful, they might have just saved a goal which, as it has transpired could be worth its weight, if not in gold, in reaching the quarter-finals. According to one of the Australian coaching staff, this was a rare self-confessed “brain fade” from the Hockeyroos wonderful goalkeeper Rachel Lynch. The big question for all umpires out there though is what would the decision have been had the referral been upheld? Back to the penalty stroke or a free hit out? While bettering your goal difference is one thing, gaining a point from a draw is another level altogether and that is why it would be understandable if Black Sticks coach Mark Hager had a polite word of concern to the Umpire’s Manager about Japan’s second goal in their 2-1 loss to Japan. With NZ pressing for an equaliser, a speculative aerial was intercepted and played forward to Minami Shimazu who rounded the goalkeeper and, on her reverse, hit the ball into the open goal. The trouble was, as players and umpires through most grades now know, when the ball had been hit by Shimazu, it had risen off the ground with the tell-tale looped trajectory that was slower than the speed of the swing and which almost always means that it’s been “topped” by the back of the stick. Despite that, the umpire awarded the goal and although NZ scored four minutes later, Japan held on for a hard fought win. Now, let me first of all say that none of this is Japan’s fault and nor am I questioning the ability of the umpire. It does however seem crazy and somewhat inconsistent that with the use of video at hand, we are talking about such an important goal being allowed to stand when, had NZ been able to refer it, it would almost certainly have been reversed. I also take the argument that NZ had played their referral card and lost but back of the stick, just like the ball coming off the foot, is the equivalent of football’s hand ball and whether it’s Diego Maradona or Thierry Henry, we all know the justifiable uproar that has caused over the years. After watching the extraordinary over-complication of VAR at FIFA’s World Cup, I couldn’t imagine for a second finding myself wondering if hockey should adopt any of their methods but maybe this shows that the VU checking the goal that has been awarded and letting the umpire know if there is a problem isn’t a bad idea. Again, I’m happy to side with the umpire and say that the speed and angle of the play and the crowd noise has prevented her from seeing and hearing the critical clues of incorrect contact but surely we want goals scored with the correct side of the stick, no matter how close or open the goal is. That is like reading the published views of a 16th Century Skeptic who knew he would be burned at the stake, for stating in plain language and spreading to others, what he really believed. Does crowd noise prevent seeing? I find it odd that Todd Williams should write an article about back-sticks and umpiring, especially in relation to Tournament positions at the pre-Quarter Final stage of a World Cup when we recently had a Commonwealth Games Final between Australia and India decided on the failure of an umpire to penalise an intentionally raised hit pass from outside the circle – which is a clear offence – a pass from which the only, and therefore the winning goal, was scored by the Australians with a volley hit from that raised pass . A Tournament Final decided on a combination of cheating and incompetence – where was the protest? Is that umpire in retraining? Are the players (especially the Indian players who should have asked for a video referral and clearly stated why they were doing so) being taught the Rules of the game? The Indian team were under pressure for much of the match and did not at any time seem likely to win, but they did not deserve to lose like that, through the carelessness of an official. So what to do about the potential back-stick problems? That’s easy, delete the offence. “Back-sticks’ is no longer sensibly an offence; and if it is possible to abolish the prohibition on above shoulder playing of the ball and, before that, Rule concerning the raising of any part of the stick above the shoulder, it is simply part of ‘progress’ and common sense, especially when edge hitting has been permitted for years, to allow the ball to be played with any part of the stick. Stick-work would not disappear, in fact it could be expanded, as ball-stick movements not legal now, could be added to the repertoire of those prepared to put in the necessary practice. In another match, ARG v GER, I cringed as a television commentator, an expert international level player, demonstrated in commentary that she has no awareness of the Obstruction Rule, as she fulsomely praised a GER player for using her body to shield the ball from an opponent. As it happens she was wrong; the GER player collected the ball while facing towards her own goal and then immediately and quickly moved away from her ARG opponent – and the ARG player let her go – allowed her to create ample space to turn on the ball and pass it towards the goal, and from that pass a goal was scored. There was no use of the body to shield the ball in that incident. Ball shielding is an illegal action carried out when there is an opponent within playing reach of the ball who is demonstrating intent to play at the ball, and who could play at it but for the shielding of it by the body or stick of an opponent – it is specifically prohibited within Rule 9.12. So back to the JAP V NZ match and an incident shown at the end of the clip. A JAP player in possession of the ball turned to position her body between a close NZ defender and the ball (ball shielding) and then backed into her (a second criterion of obstruction), I am not sure from the video if she made contact but it is possible that she did (a physical contact offence). The NZ player was obliged to move away to give herself room to use her stick to either side of her opponent. The umpire positioned about 3m away saw nothing untoward in the play of the JAP player and allowed play to continue. I find it absurd that there is ‘hand wringing’ about back-sticks but very few seem to care ‘a toss’ about obstruction. But it is certainly the most important Rule in the book after those concerning dangerous play. Back-sticks even when there is no attempt from the player doing it to disguise the fact it has occurred, is generally difficult to see and it is frequently impossible to determine if it has taken place, even with video replay. Obstruction on the other hand is usually a full body block – players don’t even much bother with fast and subtle half-turns these days (but see clip below), they are generally blatant and brazen and even slow, when using their body to block off an opponent (also in the clip below). The only real difficulty, is the speed of the action, the duration of the obstruction. An obstruction that disadvantages an opponent sufficiently to prevent them playing the ball when they would otherwise have been able to do so can occur in a split second – the time it takes a moving opponent who is shielding the ball to have run beyond playing reach. If an attacking player moves her opponent’s goal-side of the ball before she comes to within the playing reach of her opponent and then maintains that position as she moves across her opponent – thus shielding the ball from her as she does so (usually done with the back presented full on to the opponent) – there is no turning action at the position of the defender but there is certainly obstruction. The video below shows two different kinds of obstruction offence. The first in the first seconds of the clip (and later in slow mo) is by a NED player who runs ahead of the ball and between the ball and an ARG defender. As the ARG defender, unable to play at the ball, accelerates to try to get ahead of her, the NED players slips the ball behind her legs to a team-mate (clever stuff and obviously a rehearsed move). The second obstruction is by an ARG player who simply runs in front of the NED ball holder – between her and the ball -and then props to physically block her off from the ball (rough stuff). I suppose that the umpire played an advantage as the ball ran on to another NED player. I would have awarded a penalty stroke to the NED team for that offence (Oh yes, definitely), if I had not already penalised the first obstruction by the NED team. So what do we do about this sort of thing? Delete the Obstruction Rule or retrain our umpires and our players? I can’t accept a deletion of the Obstruction Rule because that would lead to a fundamental change to the playing of the game. Retraining umpires would probably necessitate doing without the services of many of the current FIH Umpire Coaches, for who could retrain them but themselves? They show no sign of changing what they are currently coaching (which is to “take the whistle out of the game” by ignoring Rule breaches). To apply the Obstruction Rule it is necessary to believe that there is such a thing as obstruction and that it is described in that Rule – and they obviously do not believe these things. The Umpire Manager’s Briefing for umpires at FIH Tournaments. 2017. 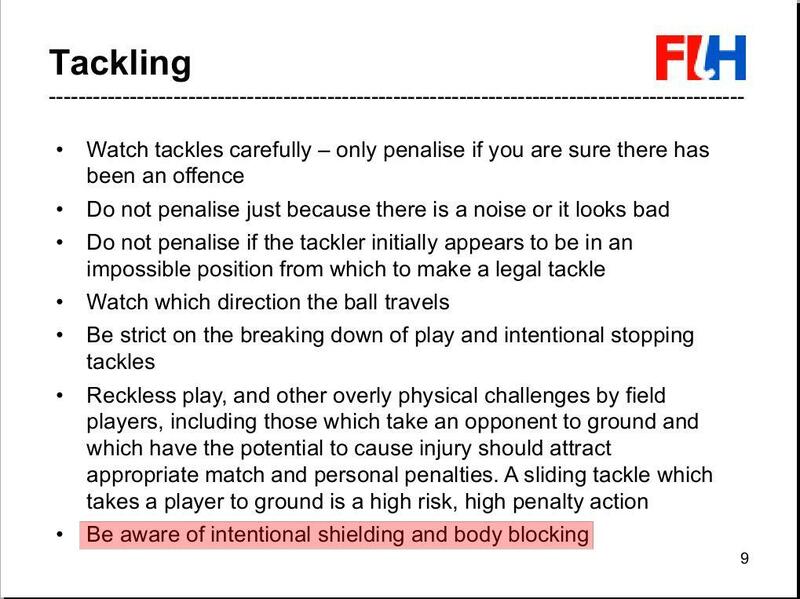 The UMB and the Rule appear to agree that ball shielding to prevent a tackle attempt by an opponent is obstruction but, oddly, the Rule does not use the words ‘to prevent’ but the vague ‘from’. We moreover often hear umpires declaring that a player was not obstructed because he or she was not in a position to play the ball and therefore there could be no legitimate tackle made – even though, as in the videos above and below, that player is at the time within playing reach of the ball, in a balanced position, demonstrating an intent to play at the ball and is only prevented from playing at the ball because it is (deliberately) blocked from him by the stick or body of the player in possession of it. As a result players in possession of the ball have become skillful at obstructing opponents who are trying to tackle for the ball and nobody expects them to be penalised for it, not even the tackler. The defender in his turn will shield the ball along the base-line or hold it shielded in a corner with no expectation that these obstructive actions will be penalised – the obstruction shown below was not penalised. This has been going on for a very long time. Everyone knows this situation is a nonsense but nothing is being done to resolve the contradictions. Instead, if anything, excuse is being found not to penalise what is obviously obstruction. This is not a call for Rule change, even if the minor clarification suggested above (from -> to prevent) would be helpful, but a call to apply the Rule “As is”. Is there any argument about the illegality of ball shielding to prevent a legitimate tackle attempt? Any doubt about what the Rule or the purpose of it is? Is anyone suggesting that moving to shield the ball from an opponent is legitimate play? I don’t think so. So what is the problem?